You may remember when Geek Tech showed you how you could make your home geeky cool. Maybe you took our advice and have a fully kitted-out geek haven of a home, but there's one thing missing--a geeky mode of transportation in the driveway. But here are just a few clever, flashy, or just plain nerdy modes of transport, some of which you can make yourself. The future is here! Recently, a few hover car developers that have produced or designed vehicles capable of flying instead of sticking to the road. At present, two are even trying to get 'road' approval (as it were), so people like you can legally drive them. 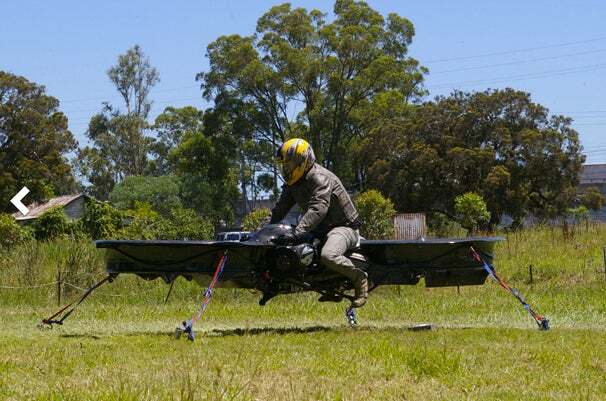 One of the coolest has to be Chris Malloy's Hover Bike, which is supposedly capable of flying up to 10,000 feet. For $40,000, you can own a flying bike, which can go up to 92mph and run for 100 miles straight. A fully-operational Batmobile is the ultimate geeky garage possession. There are hundreds of Batmobile mods out there, but the best one is Casey Putsch's replica of the version from the 1989 movie. Not only does it look like the real deal, but it essentially runs like the real McCoy--it was created using old military parts, including Boeing turbine engine. Yes, a turbo-powered Batmobile which can be driven like an ordinary car. Cool! The car comes complete with an iPad for GPS and music playback. For full specs, check out Putsch Racing's website and watch the video below to see how it drives. If you ever decide you want to cruise along a sidewalk on a Segway, make yours really stand out by making it a Tron Segway. 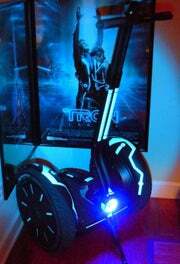 Created by Ricky Brigante, the mod was relatively straighforward: He used a string of blue LED Christmas lights, reflective tape, and electical tape, and attached it all to his own segway. Watch the video to see how the segway looks (mainly in the dark). If you can't afford an actual Segway, why don't you make your own? That's exactly what researchers at the MIT Labs did--learn how they did it. Heading off to the the big chore of grocery shopping? You can make it a little quicker with MIT's Motorized Shopping Cart. Students at the Labs created the trolly out of old go-kart parts, an engine, and also improved the wheels to make for a smoother ride. Read the Miters Blog to find out more about the cart and other little projects undertaken, or watch the video to get the tour of the campus from the cart. OK, maybe you don't need a Segway. Maybe you just want to make your bike geekier. Or in Emily Brooke's case, safer. 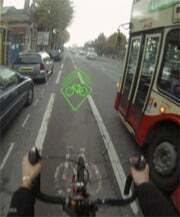 Emily, a student at the University of Brighton, was aware of how dangerous cycling on the road can be, and wanted to help make bikes more visible to drivers. She created a small, battery-powered device, called BLAZE, which sits on your handle bars and projects a laser image onto the road ahead, alerting other road users to your whereabouts. It's visable in all light and can also flash, making it hard to miss the green laser. Do you have and cool transort meds at home? Any we missed off the list? Tell us in the comments below.